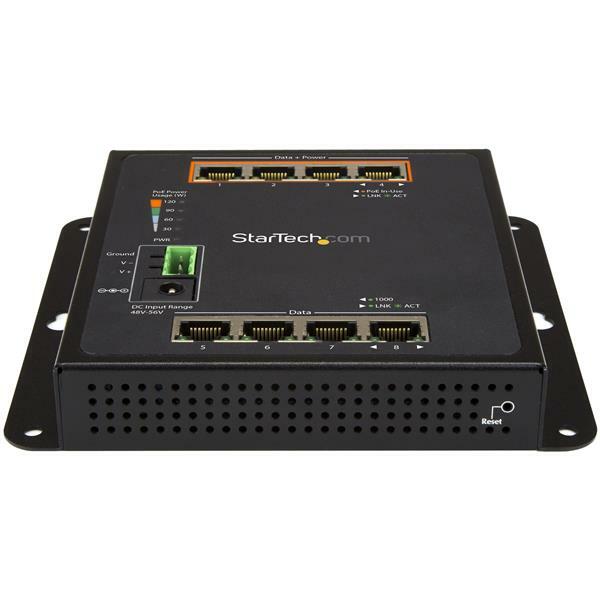 Easily deploy or scale your network with this Gigabit Ethernet switch, by adding eight copper Gigabit Ethernet (GbE) connections, including four PoE+ ports. This IP30 industrial network switch provides intelligent Layer 2 management. Its rugged, compact design and wall-mount option with front access make it ideal for demanding applications, even where space is limited. 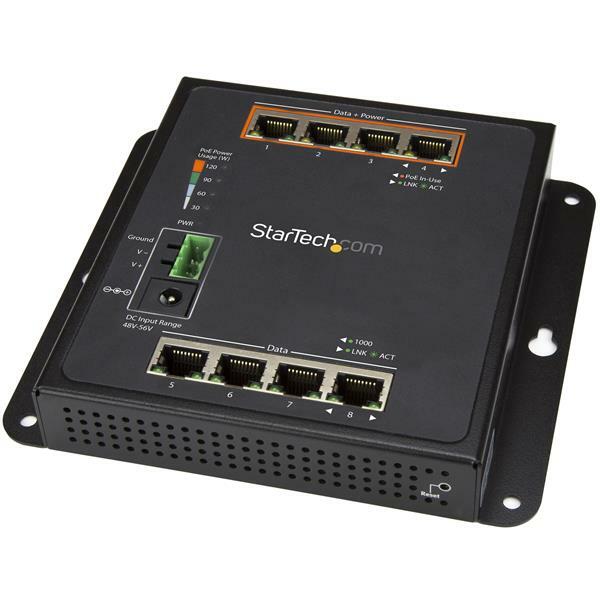 This Gigabit Ethernet switch lets you expand your network by connecting up to eight RJ45 devices (four PoE+). The 8-port switch enables up to eight users to share files and devices, such as printers and scanners, over a LAN connection, by enhancing your existing network capacity with additional ports. The switch gives you the freedom to place your equipment in locations where power outlets are not available, with support for Power over Ethernet Plus. The network switch provides abundant PoE power, with up to 30 watts for each PoE port (120W budget). 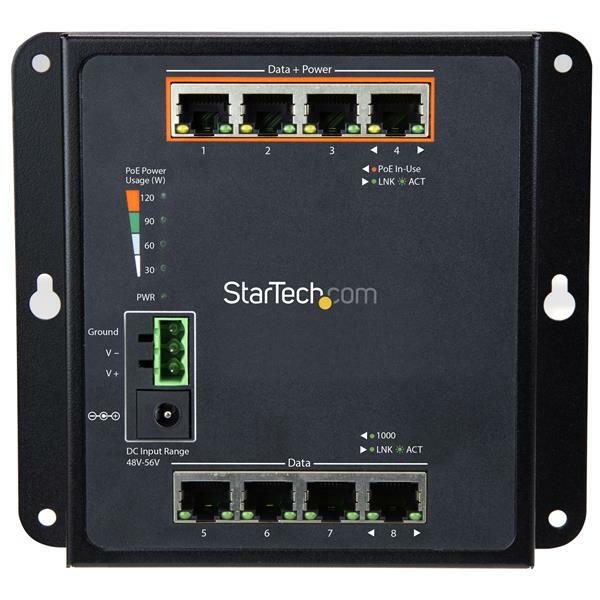 With its compact design, you can wall-mount the Gigabit switch to provide convenient front access to ports and indicators. It’s ideal for a wide range of applications, including tight installation areas with significant electromagnetic interference, such as control cabinets and panels. The network switch is also DIN-rail mountable. This rugged network switch features an IP30-rated metal housing and extended operating temperature range of -40°C to 75°C, which makes it ideal for a wide range of conditions. The sturdy metal enclosure offers durability, even in harsh industrial environments. With support for 10/100/1000Mbps transfer speeds, this managed switch supports full/half-duplex auto-negotiation, jumbo frames, and auto MDI/MDIX operation. This lets you connect your network devices quickly and easily, with little to no configuration required. To help prevent any unnecessary downtime, the switch features redundant 12-58V DC terminal block power inputs, which ensures seamless operation in the event of power dips or failures. The IES81GPOEW is backed by a StarTech.com 2-year warranty and free lifetime technical support. A power adapter is not included with this switch. This device's default static IP address is 192.168.0.100. Make sure that the IES81GPOEW is on the same network as your computer. In an Internet browser, enter the IP address of the unit. The default IP address is 192.168.0.100. In the password field, enter the password. The default password is admin.